!Easy ScreenSaver Station is a cool ScreenSaver maker software to make your own ScreenSavers easily. You can create your own ScreenSaver with the New Wizard step by step. Images, Flash movies and background music can be included into your creations easily. You can even acquire photos from your digital camera(or scanner) directly. After some easy steps, you can save a single standard ScreenSaver(.SCR) or a self-installing ScreenSaver(.EXE) for distribution. More features such as image editing, transition settings, icon setting, copyright settings, password protection, preview, email sending and so on are included. No programming skills or royalties required. !Easy ScreenSaver Station can also manage your ScreenSavers so that you can run, install or config one easily. 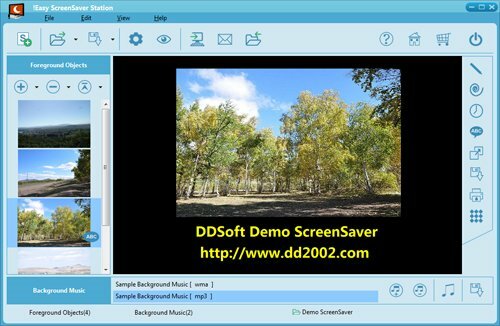 Key features: * Create your own ScreenSaver with New Wizard step by step; * Make ScreenSaver with images, Flash movies and popular formats(mp3/wma/wav/midi...) of audio files as background music; * Make translucid ScreenSaver; * Open and edit your ScreenSaver file directly. You do not have to save a separate project file; * Play images or Flash movies randomly or in a specified order with transitional effects; * Edit images to mirror, rotate, crop, resize images, or adjust the colors; * Acquire photos form digital camera/scanner directly; * Show your images or Flash movies as LOGO throughout the running period; * Add labels as title or description; * Set Icon for your ScreenSaver; * Set password to protect your creation; * Preview your creation before saving; * Distribute shareware ScreenSavers, and generate your own registration codes for them; * Create ScreenSaver Data(.SSD) files for integrated SCR Player; * Install, create shortcut, or e-mail your ScreenSaver; * Manage your ScreenSavers to run, install or config one; * Activate your ScreenSaver instantly; * Set wallpaper; * Multi languages supported; * Drag and Drop operations and more. Anyone can distribute our product without modification. You may not alter the SOFTWARE PRODUCT in any way, including its help and text files. The SOFTWARE PRODUCT IS DISTRIBUTED "AS IS". NO WARRANTY OF ANY KIND IS EXPRESSED OR IMPLIED. YOU USE IT AT YOUR OWN RISK. DDSOFT WILL NOT BE LIABLE FOR ANY DATA LOSS, DAMAGES, LOSS OF PROFITS OR ANY OTHER KIND OF LOSS WHILE USING OR MISUSING THIS SOFTWARE. !Easy ScreenSaver Station SOFTWARE LICENSE AGREEMENT LICENSE: Trial Version !Easy ScreenSaver Station("SOFTWARE PRODUCT") is not freeware. You may install the trial version of the SOFTWARE PRODUCT to test and evaluate it for 30 days; after this time you must either buy the license to use permanently or delete the SOFTWARE PRODUCT from your hard disk.